Durahide is a synthetic product made to mimic the look and feel of leather. It is used to make a variety of pieces of furniture, from couches to chairs and ottomans. 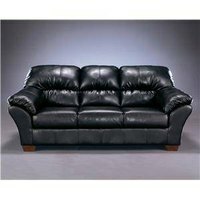 It does a decent job of looking and feeling like actual leather, but when it comes to cleaning furniture made with Durahide, one must remember he's not really dealing with leather. Durahide comes with its own set of options for cleaning its faux leather surface. Gently wipe Durahide furniture with a soft cloth. Cotton diapers work well. They are sturdy enough to withstand repeated cleanings, while soft enough not to harm the finish. Wiping away dirt and debris promptly will help prevent ground-in dirt and stains. Mix mild dish or hand soap in a bucket of lukewarm water. Soak and wring out one end of a cloth diaper or other soft cleaning cloth. Rub stains or dirt firmly but gently until they lighten or the Durahide becomes clean. Rinse the cloth in clean water and wipe away any soap residue from the Durahide furniture. Repeat the washing and rinsing process until the dirt and/or stains are removed. Don't use harsh cleaning products on Durahide, as they can dry and crack the surface. Massage a small amount (1/2 tsp. or less) of baby oil into stains that didn't come out with the soap and water process. Using the soft cloth, rub gently but firmly. Go over the entire area where the oil was applied, wiping again with a clean, dry cloth. Treat Durahide gently, as it is a synthetic. Avoid eating and drinking while sitting on your Durahide furniture to extend its durability. Repeated washings and conditionings can wear down the Durahide surface, so proceed with caution. Does an Ottoman Have to Match the Couch?